''Spring in Chee Dale'' shows the River Wye which runs through Chee Dale in Derbyshire. Chee Dale itself is a gorge flanked by limestone cliffs. The valley Is wooded in places and meadow land in other parts. 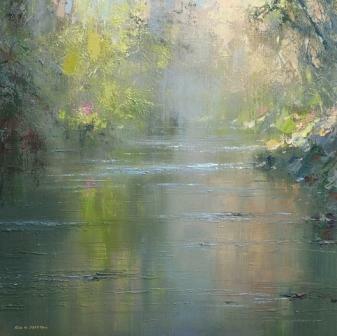 Rex Preston has chosen to paint the luxuriance of Spring foliage dripping into the river gorge. Fresh green colour and dappled sunlight are reflected in the river and Preston captures a sense of the peace and beauty of the landscape he observes.